In Bulletin 234, Ruth told about her wedding in May of 1947 to Vernon Swanson, a sailor in the US Navy. He had to return to the Naval base in Pearl Harbor after the wedding but she could not accompany him to Honolulu until he was able to get housing for them on base. 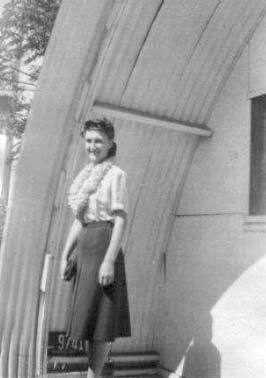 In this series, Ruth tells of her experiences as a 21-year-old bride in Hawaii just after World War II. Right now I have forgotten the exact date of sailing from San Diego to Pearl Harbor on a "converted" troop ship -- but the last days of October 1947 would be about right. Here is how it went: I got on board with all the papers, etc. and stood around looking at everything. I had a Coke before the ship left the shore -- and got SICK! I was taken to the stateroom where I was supposed to be -- at the top. There I was shown my small room. It had two bunk beds on one wall and, a few feet across, two more bunk beds -- and a passageway to the door of a very small room -- not really a bathroom -- but sufficed for one. Three other ladies were in the same cabin and one was pregnant. As you can imagine, we three were "sick" the most. The poor pregnant lady didn't have time to be sick, herself -- with a baby about a year old! 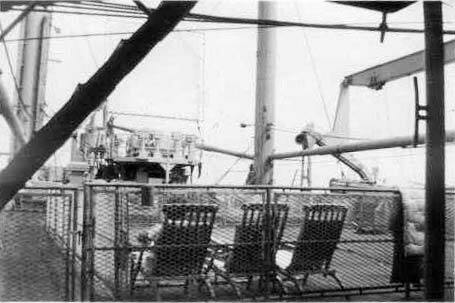 Sun deck of USS President Hayes. Ruth spent hours here in the middle of the Pacific Ocean. We sailed -- ROCKED -- for four days! We had a neat little Filipino steward -- and he really tried to take care of us poor women! If one was in the bathroom, another was using the wastebasket -- and so it went. I'd walk up the stairs to the deck for air, and then walk by the galley and -- wafting out -- GREASY "aromas"! Not until the 5th day did I dare eat anything, besides sucking lemons! After five or six days of rocking and rolling, the day to land arrived. All of us wives were dressed! On deck I think there were about 100 wives ... leaning over the railing to get a glimpse, even, of LAND! It was great! Ruth's cabin mates on landing day -- all the wives were dressed up -- ready to dock for re-uniting with their husbands, looking forward to a new life! Jeeps and other vehicles were coming and going -- all the wives were getting picked up! And you would know, many hugs, leis, tears -- but here I was -- standing alone! Walking back and forth -- looking, looking for someone familiar. I couldn't stay on the ship much longer... Can you guess who was scared? And then -- after probably half an hour -- my sailor came racing up in a jeep. Someone had given him the wrong time! He'd had to borrow his Chief's jeep -- so off we went -- after an explanation! 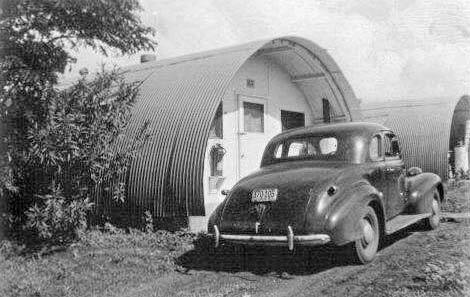 Home, Sweet Home -- in "Hut 67"
Around and around this dirt road and that one we went -- and all of a sudden we drove up to this Quonset hut. I got out and walked slowly into my new home. Yipe! This building was very long! It was divided into three sections and we had living quarters at one end. Two other families occupied the other two sections of the "hut," as they were called. Each part had a small bedroom, a kitchen and living room combined -- and a bathroom, of course. The water heater was on the back porch. No windows on one side, just screens, because it only rained from one direction. After a few good looks around, Vern said, "The Chief and his wife want to come over and meet you!" PANIC! How do I act in the presence of an officer? So, later on, I made some kind of creamed dish -- I don't even remember what it was, but it didn't thicken. SOUP! I had lived at home till then -- and cooked some, of course -- but ALONE and for company? Strangers! Embarrassed? Right! Then we had a trip to the PX to get some groceries -- most interesting, can't you guess? And this is only the first few hours! Whew! I got through the first day! You can guess it was an interesting one -- maybe a bit traumatic -- to this "city" kid. Back door of Quonset hut living quarters; window to left of door into kitchen (fire extinguisher below window); window to right into laundry room. The 1939 Chevy coupe, shipped from California, arrived a month or so later. The only bugs of any consequences we'd had in Minnesota were mosquitoes, and they weren't very big. In Hawaii, we had an abundance of bugs. The worst were the huge cockroaches -- and by huge, I mean probably 2+ inches! They liked to come out at night, so when we would get home at night I made Vern take off his shoe, open the door very carefully, and throw the shoe in to scatter them! It helped! Once when we were visiting a friend's house on a Sunday afternoon, we were enjoying a visit with several people when here came a huge cockroach ... crawling along on the back of the davenport, right behind my head! I froze and didn't move for quite a while! It didn't stay very long, though I was too scared to look for it for a while. It is hard to believe, but some of the Orientals believe cockroaches are good luck! Vern worked on the base as a yeoman, a petty officer in the Navy assigned to administrative duties, doing clerical work -- he even did shorthand. After a couple of weeks, I wanted to find some work, too. I had finished the Medical Secretary class at the Minneapolis Business College and had had a position in an orthopedic front office, doing transcription, etc. I took shorthand notes as the doctor dictated from behind an almost closed door, depending on the patient. A plastic surgeon shared the office, so I had a lot of experience in both fields. So, for starters, where do I go, as an absolute stranger in that town? Vern found out where some of the hospitals were. So I went to the St. Francis Hospital. (It isn't there any more -- it has been absorbed by bigger facilities.) I asked at the front desk about employment and the lady there brought out Mother Superior, who was a very charming lady, much older than I. After my weak story, she said, "Well, we are just talking about making a position in Surgery for a secretary." WOW, just what I had hoped for! I was hired right there! Not even any tests, etc. in those days. I was given a desk in the outer lobby of the Surgery Department. As each surgeon would finish his or her operation (very few ladies were surgeons way back then), they would come out and dictate their surgical procedure. I would then type it up and deliver the reports to the respective floors. Usually, that took the morning. In the afternoon, I went to the Records Department and helped with some coding (of procedures) and filing. In the Records Room, I worked with a very sweet Japanese girl and we got well acquainted. She was engaged at that time and then she set her wedding date for May 22, 1948 -- our first anniversary! 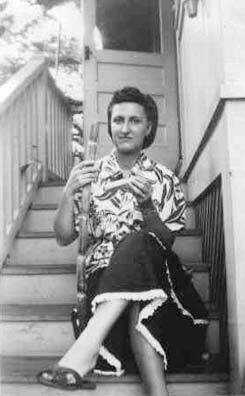 Co-worker Mildred Sokoi, now Mrs. Charles Okimoto, 5/22/48. The wedding was in a huge Buddhist temple. I'd never been in one before, though by that time we had driven by many of them -- in awe at the size. So here we two Americans sat, in the shadow of this huge Buddha "looking" down on us ... hmmm. We had no idea of what was in the ceremony, etc. The reception was in a different building and was attended by many people! We were all shoeless, of course. All sat on the floor, crosslegged (if you could) and there were "boards" in front of everyone, loaded with Japanese foods, and whatever. There were lots of talks by family members and others. It was mostly in English, and very fascinating. During the hospital time, I was most impressed with the Oriental doctors; they were so polite and helpful. But the American doctors, not all, but too many for my taste, were VERY arrogant and impolite. I hardly dared even ask a question about a word in a report. I would never go to see an American doctor -- though I did see a couple of Oriental doctors (nothing serious) and liked them very much. I continued working at the hospital until Vern was ready for discharge. 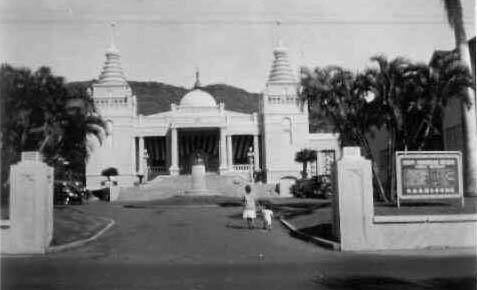 Buddhist Temple where Mildred Sokoi was married. During our year at Pearl Harbor I worked full time, so we just had weekends to go sightseeing and do the usual things, shopping on Saturdays, etc. We didn't have the $$$ to do much more than work, etc. 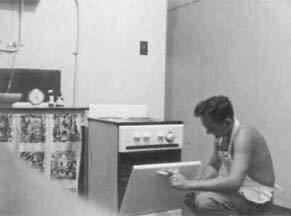 Vern loved to cook, so I thought you'd enjoy those pictures. We had friends there, so we had meals with them a lot and we had company, too. There was not much on the base for us to do, so we just lived the quiet life of newly-marrieds. Our Sundays were a lot of just driving around the island -- looking at the Blow Hole, etc. Our "sightseeing trips" would be what they called "around the Pali," which was just a small corner of Oahu. At that time, all the rest of the island was "off limits" to the servicemen (unless they were stationed there for some reason). We did get to the Aloha Tower; it was shorter than the Foshay Tower in Minneapolis but was the tallest building on the island. Of course, now it is dwarfed by all the high-rises, etc. The tour was usually to check out the fruit and vegetable stands available. We'd never dare eat vegetables that grew in the ground! You probably can guess their growing conditions -- fertilizer sources, etc. The fruit was excellent and a big staple in our eating. Did we shop? Oh yes, the biggest store was Sears. It even had an escalator in it (about the only one on the island, I think!). It seems to me there was a Woolworth's, and the other usual shopping areas. Wal-Mart was never heard of then. 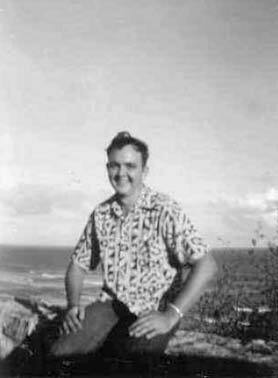 Vern Swanson loved to cook in their Hawaiian Quonset hut home. We were with our dear friends, the Clementes, for Thanksgiving. They were so good to us. There is only ONE man alive who lived there when we did -- and he is not well. He and his wife were very good to us, too. We were by ourselves over the Christmas holidays. It was chilly! But I was from cold, wintry MINNESOTA -- and so we DID go to a beach! And I did get my feet in the water -- but a too cool breeze prevented any more than that. I had to tell everyone in Minnesota that we went swimming on Christmas! After all my winters in Minnesota, this was indeed a thrill! And just in case you are wondering -- WE WERE QUITE ALONE on that beach! One Sunday we went to some friends' home -- it was called "the other side of the island," Nanakuli, and we got to swim most all afternoon! Guess who got burned to a crisp? One young boy said to me, "You look like a lobster!" 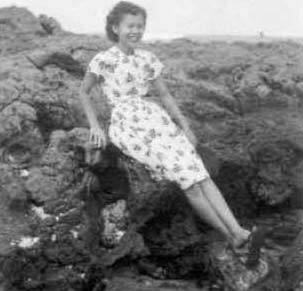 Vern Swanson, oceanside overlook; Ruth on holiday, wearing a lei. I don't remember much about the car, but Vern wanted this Chevy coupe. (A 1939 model, I think. Maybe some our older readers would know more about the year of the car than I do.) You know the dreams people have of "someday I want a car like that." We got it before we left Minnesota and drove it to California -- but with a big "hitch." Out in the desert, near Las Vegas, absolutely new territory to both of us and dark at night, something happened. Something dropped out of the bottom of the car. Now I have forgotten how he ever found a place to get a tow truck -- 75 miles! Can you imagine the $ we poor kids didn't have -- and to have to leave it there? And he was going to be LATE to get back after his leave -- and that was about the most unforgiving absence ever! Petrified? I think he was, more than I. I didn't know what to expect. But there was good news, even to that. We got to Pearl Harbor -- Hut 67 -- and were told the car was on a ship -- and then, like so many things, it didn't get shipped when it was supposed to. I believe it was about a month before it came. Before we knew it, the time was coming to get ready for discharge! After six years, it was welcome for those in service that long. We had been told we were going to fly back, so we shipped the car to California. Yes, for a fee. So then, Labor Day weekend, we had to say ALOHA! to Pearl Harbor and all our memories. It was hard to leave Pearl Harbor after so many months, but that's the way it goes ... in the service. As luck would have it, we didn't get to fly -- and so we had a five-day sail back to San Francisco --- and who was sick? It was only four days of sickness this time. My 10 months in Hawaii were hard to describe in a short time -- but I would not change that experience for anything. 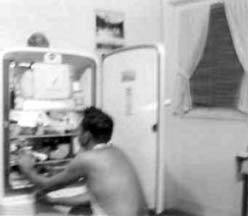 Vern Swanson, my sailor boy and his '39 Chevy coupe, left; Ruth, eating sugar cane at Bill Achi's home, right. We were fortunate enough to stay with them and their four children after we left our home in Hut 67. 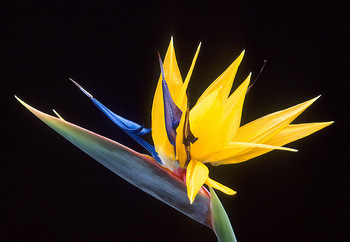 Bird of Paradise bloom, our favorite Hawaiian flower. 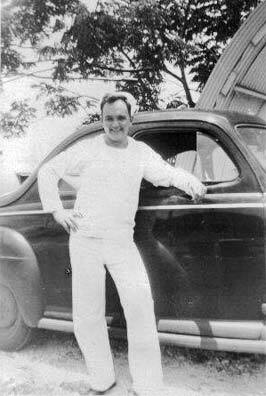 Our last days in Pearl Harbor were the last week of August, 1948. Vern had been told that we would be flown to Treasure Island Naval Base, so we shipped our car ... and then we didn't fly after all! The car was gone, however; I do not remember when we got it, but it was after we got back to Minnesota. We rented a car and drove down the California coast on old Highway 5, to El Monte. This was where Vern's foster sister and family lived; we were there a few days and toured the area. We planned a trip across to Coronado Island, an hour's ride, and I got seasick on that! I was surely tired of being seasick, already! 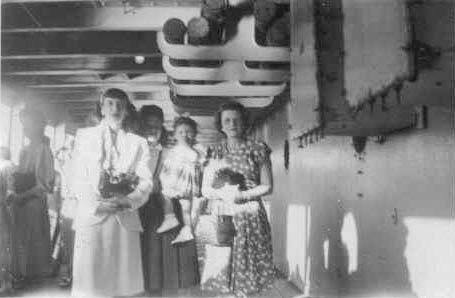 After all, I had been seasick on the returning ship for four days out of the five days that the trip took -- spent most of it resting on the deck. We then flew to Minneapolis, to my parents' home. My father had a sheet metal business on Nicollet Island -- in the middle of the Mississippi River -- so there was water on both sides. Probably not many people now would remember when there were a lot of small businesses there. Our father's business was in the middle of what was about three blocks -- and there was a three-story hotel over those businesses. My dear parents rented a large room on the second floor as a studio apartment for us -- completely furnished with small refrigerator, small kitchen stove, sofa and Murphy bed -- so very nice. We lived there for several months and then found a house to buy in north Minneapolis. We lived over Dad's sheet metal shop on Nicollet Island in Minneapolis. Vern then went to a technical school for railroad telegraphers. I do not remember the name of it, and it isn't there anymore -- around Lake Street, I believe. The thought was, there will always be trains! (NOT!) I worked in another doctor's office during that time. When he finished that training, Vern's next thought was, "Now where can I find a job?" We found out in short order -- packed up some belongings and headed for Montana. We bought a small travel trailer and were off to the Wild West. We landed in a town called Townsend, Montana, and found a place to park the trailer. Vern went to work in a station about 20 miles away, down a very steep, narrow, mountain road. He worked there for about two years and then was transferred to the next town, Three Forks, and worked nights in that railroad station. We bought a small house in Three Forks. Vern worked nights all those three years. Our first two children were born during that time. I then had a job as a teller in a bank in Manhattan, a small, country bank. Vern took care of the children days and slept some. In the course of events, we got acquainted with a Kitto family -- parents, two sons and their families -- and had great times together. We spent a lot of time at the Kitto cattle ranch. Vern loved to help there with the branding of calves, horseback riding, helping move cattle from various places, and whatever they needed help with, he was there. Our friendship grew over the years and has continued to this day. Fast forward now to 1955: The railroads were going downhill, so we decided to go back to Minneapolis. I was back in the medical field again. Vern got a position as a food buyer and worked in a couple of the big restaurants. Fast forward again to 1977: Vern's rheumatoid arthritis was getting worse and we heard of doctors in Mexico and "great" results achieved for some of our friends. So that prompted us to "pick up" again and move to Arizona. We have lived in the Phoenix area ever since. Our friendship with the Kitto families continued -- we visited them in Montana and they visited us here in Arizona. Ken Kitto's wife died of pancreatic cancer in January 2000. Vern's health continued to decline and he died in November 2001. After a time, Ken wrote to me, suggesting that we spend our "11th hour" together and we married in March 2002, almost five years ago.